Free Shipping Included! 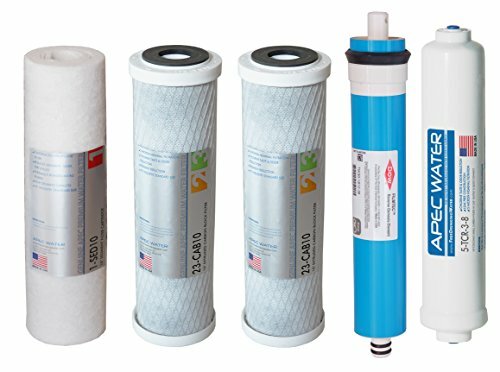 APEC US Made 90 GPD Complete Replacement Filter Set For ULTIMATE Series Reverse Osmosis Water Filter System with 3/8'' Quick Dispense (For Upgraded System FILTER-MAX90-38) by APEC Water Systems at Friv 4 Friv . MPN: FILTER-MAX90-38. Hurry! Limited time offer. Offer valid only while supplies last. All US made super high capacity filters: 1st Stage: High-Grade 10'' high-capacity polypropylene sediment filter -removes dust, particles, and rust. 1st Stage: High-Grade 10" high-capacity polypropylene sediment filter -removes dust, particles, and rust. 100% pure polypropylene depth filter with exceptional dirt-holding capacity translates to longer life and fewer change-outs than existing string-wound or resin-bonded filters. 2nd and 3rd Stage:10" Premium Extruded Carbon Block -gets rid of unpleasant chlorine, tastes, odors, cloudiness and colors. Also removes VOCs and other common chemicals from the water. APEC's extruded carbon block filters consist of activated carbon particles fused into a uniform block with enhanced adsorptive capacity and efficiency. Unlike granular activated carbon (GAC) filters, these extruded carbon block cartridges will not channel or bypass due to the extreme uniformity of their extruded activated carbon core. 4th Stage: Select FILMTEC (Dow Chemical) High Rejection TFC reverse osmosis membrane. Removes up to 99% of total dissolved solids (TDS) and contaminants such as arsenic, lead, fluoride, chromium, radium, bacteria, viruses and much more. 5th Stage: Advanced Coconut Shell Refining Carbon 10" - TCR (Total Contamination Removal) filter removes any possible residual taste from the tank. For over 20 years, APEC has been an industry leading manufacturer of high performance ro systems. APEC Water Systems does not distribute or sell our products to any 3RD party sellers on Amazon. Please purchase genuine APEC Water System product in "new" condition from Amazon.Com or APEC Water directly for authenticity. Manufacture warranty may not apply in all cases, depending on factors such as use of product, where the product was purchased, or whom you purchased the product from. Please review the warranty carefully and contact APEC if you have any question.